Throughout the gaming community, one game in particular has received a bad rap. No, I’m not talking about Settlers of Catan(that is an article for another day.) No, today, dear reader, I would like to talk to you about a fantastically successful series of games that strangely enough, most gaming aficionados will groan and roll their eyes at if you attempt to bring it to the table: Munchkin. 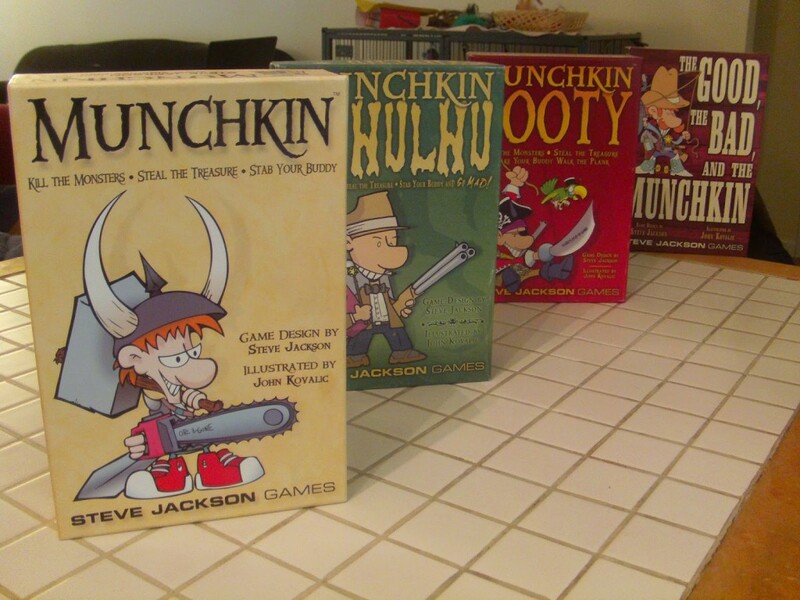 The Munchkin series is one that has become incredibly successful since it was launched in 2001 by Steve Jackson Games. In the years since, it has spawned fifteendifferent standalone themes (each with a myriad of expansions) and also, it’s very own board game variant: Munchkin Quest (which has its own expansions.) So, why is it that despite it being so popular, so many gamers despise it? While I think that part of the equation may be the resentment that some people feel towards anything that gains a certain amount of widespread popularity, I believe there are two legitimate reasons at the core of many gamer’s intense disliking of this game. You and your friend have just started a game of Munchkin. Your friend has drawn off the treasure deck a starting collection of incredibly powerful (and rather useful) equipment- a nice array of weapons and armor. You, on the other hand have some rings and a pair of smelly galoshes. To make matters worse, every door you kick down reveals either an incredibly high level monster, or some sort of curse, whereas your opponent reveals easy monster after easy monster (and subsequently racks up the levels and loot.) The game has just begun and already you know that there is no way you are going to win. You’ve been watching and waiting patiently as your opponent has been climbing closer and closer to level ten. You now have in your possession two really awful cards to lob at your opponent. One really nasty spell and a backup if the first one fails. You launch your first attack- no luck, your opponent had a card that countered it. No problem, this is why you saved your backup- oh no, they countered that one too. Looks like your opponent is untouchable and there is nothing you can do to stop them from winning. Well that’s pretty wizard, I guess. Sure, this is a worst-case scenario, but anyone who has played Munchkinfor a given length of time will tell you that it can happen. The best games out there give players a sense of agency and make them feel that the choices that they make matter. The worst games out there make players feel helpless, or that it doesn’t matter what they do- they still won’t win. So, what do you think about Munchkin? Is it “all that and a sack of gold”, or is it overhyped? Do you use any house rules to fix some of its flaws or do you love to play it as-is? Do you have any great memories of playing Munchkin? Why not share your thoughts in the comments below? Furthermore, you can find many Munchkin themes at The Game Preserve here in Bloomington. Not in the Bloomington area? Then check it out at your local game store. Support local game stores!